Joining us last autumn, Burchie directs and accompanies our adult choir. Burchie grew up in Louisa County, and attended local schools. She graduated from Westhampton College in Richmond with a degree in Piano Performance. Later she attended Louisville Baptist Theological Seminary where she earned her Master's Degree in Piano Performance. 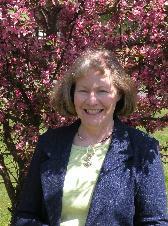 She has been active in Baptist congregations and conferences throughout her career. Burchie also accompanies the local Louisa Community Chorus and Chorale.